Because of the high value of two letter .com domain names and the fact that quite a few have changed hands for significant sums of money during the past two years, I monitor all 676 two letter .com domain names. This morning, I received a DomainTools domain monitor alert for IQ.com indicating that something had recently changed in the Whois record. 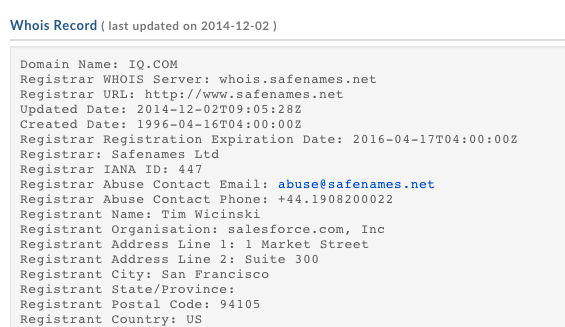 As of this morning, the registrant of IQ.com is now Salesforce.com, as you can see in the current Whois record screenshot posted below. If you visit IQ.com, you can see that the domain name currently forwards to RelateIQ.com, a company owned by Salesforce.com. According to an article online in Forbes, Salesforce.com acquired RelateIQ for $390 million in July of this year. RelateIQ is in the business of customer relationship management. Prior to the domain name transfer, it appears to me that IQ.com was owned by a California resident (possibly a company) for at least ten years and possibly longer. This morning, I reached out to the former registrant via email to see if he could offer a comment on this, and I will update this if he is willing and able to share any details. I presume there is a non-disclosure agreement involved, but I will be happy to update this with any additional details. It does not appear that IQ.com had been a fully developed business for quite some time, although I will inquire about that as well if I hear back from the former owner. It will be interesting to see if Salesforce uses IQ.com as a standalone website or if the company is content using IQ.com as a forwarder. I am not familiar with the RelateIQ brand, but it would be interesting if Salesforce opts to rebrand the business as IQ or Salesforce IQ or something along those lines. IQ.com is an exceptional domain name, and I would guess the price tag was into the seven figures, although I don’t have any details about it. Thanks to Bob Olea for sharing this with me. Absolutely it was high 7-figure sale. No doubts about that. When a high value domain names sell, there are almost always non-disclosure agreements involved, which do not allow sellers to release any information at all. You have higher chances to get some information from buyers in such cases, or from their brokers, if known. If a broker was involved (and can share info), they are welcome to email me the details. It was a seven figure deal, lower range. Transaction under NDA so can’t elaborate. …and who are you to know that, huh? Just someone who happens to know. Take it for what it is. It’s on the lower end of lower range. If I were the owner of this domain name, I would expect to get more. If the information you have provided is correct, then I can call it a great buy. Any one know or remember how much a 2 letter domain name was selling for back in 1996 and how difficult it was to find and buy one.